While ginger may be a kitchen staple for its distinct flavour, it’s also an indispensable rhizome that helps to bolster the body’s immunity and support digestion—particularly during the cooler months. But what is the best way to get the most from this often-used, potent herb? While the root in its natural form is undoubtedly beneficial, there are also convenient ways to take ginger to get the most from its warming, circulatory and anti-inflammatory properties. “Ginger is an ancient Chinese herb with a 2500-year-old reputation as a herbal remedy. It contains many phytochemicals that help the lungs function more effectively,” she says. Ginger promotes your respiratory health by helping to eliminate air pollutants, tobacco smoke and perfumes out of the air passages. It also relieves congestion, as well as improves circulation to the lungs, thus reducing the severity of many chronic lung-diseases such as bronchitis. Asthma is a long-term disease that is characterised by the inflammation of the air passages of your lungs. Ginger helps control this inflammation so you feel and breathe better. In the cooler months our bodies turn inwards and processes can slow down. Ginger warms the circulation and is particularly good for chilly hands and feet along with promoting movement to the joints, digestion, and circulation. Ginger is also a traditional herb to relieve symptoms of nausea and motion sickness, including during pregnancy and travel. Carrying ginger capsules is an essential travel companion for those susceptible to motion sickness. Add Lifestream ginger syrup to a green smoothie with a dash of honey. Ginger shifts that cooling green smoothie into a winter warmer. 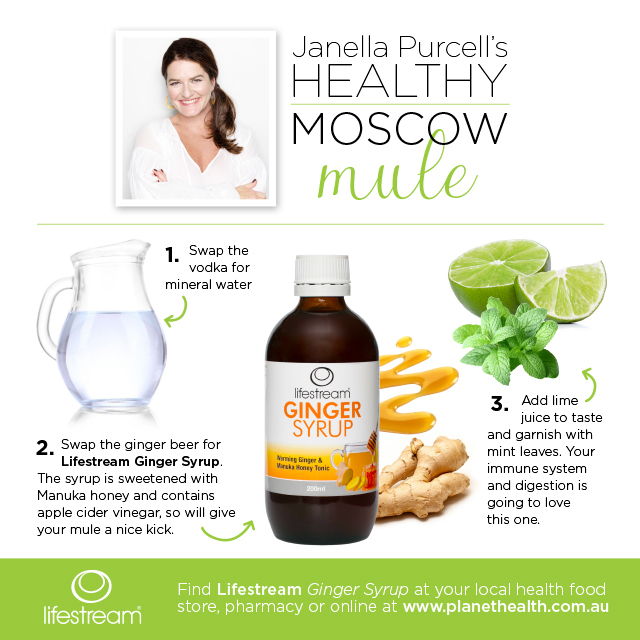 Mix warm water, ginger syrup and a teaspoon of honey to make a delicious, immune-boosting cuppa (try Janella’s Healthy Moscow Mule recipe below). Take two capsules of Lifestream ginger half an hour before departure and one or two more again if necessary during travel for nausea. Take two capsules an hour before pregnancy nausea tends to take hold. One to three capsules daily acts as an immune, digestive and circulatory tonic.